HARRIET (1900) The 92 ton schooner Harriet parted an anchor cable in a 40 mile per hour storm two miles west of Nome and was driven ashore at 9:30 p.m. September 6, 1900. The crew of 9 survived, but the Hariett, valued at $11,000 was a total loss. She was also carrying a $3,000 cargo of dogs, deer and skins of which $1,500 worth was lost. The vessel was travelling from Mechaitani Bay to Nome. HELEN LEE (1951) The 20 ton 48 foot wooden gas screw tug Helen Lee foundered March 10, 1951 near Romanzof. The Hettie B was valued at $3,000 no cargo at the time of the loss and had no insurance. 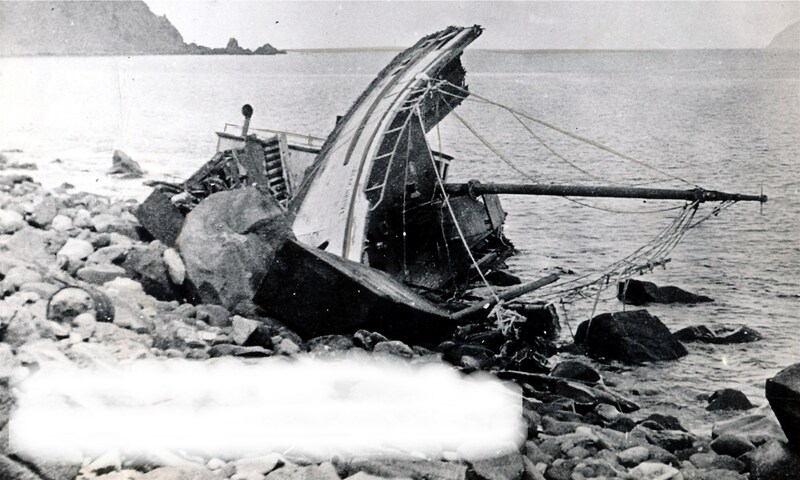 HUNTER (1900) The 124 foot 337 ton wooden bark Hunter stranded on a shoal near Cape Romanzof at 10 a.m. Saturday July 7, 1900 and became a total loss. The 27 crew all made it safely to the beach but the Hunter, valued at $20,000 and her 500 ton cargo of lumber and general merchandise were lost. The Hunter had no insurance, but the cargo was insured for $7,000. The Hunter left Seattle May 6th and was bound for Nome. The vessel stranded in a strong gale and attempted to kedge off of the shoal but efforts were unsuccessful. HUSKY II (1971) The pilot boat Husky II was consumed by fire June 28, 1971 approximately 1000 yard offshore from Bethel.